“We’ve got no chance, have we?” Chris Wilder joked, when asked how his team will fare against Middlesbrough. It was a throwaway comment, designed to mock some of the more hackneyed previews ahead of Sheffield United’s visit to the Riverside. But it did shed some light on the psyche of Wilder’s squad as they prepare for their meeting with opponents whose own chairman, Steve Gibson, insists will “smash” the Championship after lavishing £15m on one player alone. Wilder’s respect for Garry Monk’s side was plain to see when he discussed this evening’s fixture with the media at the Steelphalt Academy yesterday. However, despite acknowledging United can not compete with Middlesbrough’s spending power off-the-pitch, he insisted they can still cause them problems on it. “Maybe a slight advantage is that we’re possibly a little bit more settled in terms of our shape and our team,” Wilder continued. “How much that counts for, we’ll find out when the game gets underway. United, the reigning League One champions, opened the new campaign by beating Brentford 1-0 last weekend thanks to Billy Sharp’s first-half goal. Middlesbrough, who have spent over £40m since being relegated from the top-flight earlier this year, lost to Wolves. Wilder, whose team has not tasted defeat since January, also believes those quick to write-off their chances have overlooked the influence of United’s travelling support. Monk took charge of Middlesbrough two months ago after resigning his position at Leeds. 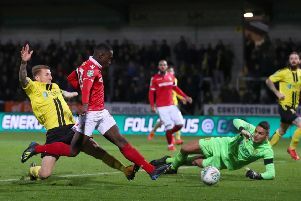 Wilder, a lifelong United supporter and former player, refused to be riled by Gibson’s comments about the Teesside club’s prospects ahead of the televised clash. (Kick-off 5.30pm). But he did admit to “not being surprised” by Monk’s decision to jump ship.